Stan's love language is not gift giving. He doesn't see things and think that I'll like them, it's just not in his nature - so generally I'm pleasantly surprised when he gets a gift so spectacularly right , it's as if he was in my head. Obviously my favourite gift this Christmas was the Harry Potter wand that controls the TV (all my Witching dreams come true!) but my runner up was the absurdly lovely book "Feeding a family: A real life plan for making dinner work" by Sarah Waldman. Christmas day was just a week ago and I've already made three dinner recipes and three desserts from this book. They're all healthy, packed with nutrients and what's more, Arthur has devoured all of them. As I might have mentioned, we've been going through a bit of a vegetable dry patch with Arthur. I've tried to remain calm about it, tried to remember that it's just a phase but, as a cook it's been really disheartening and my passion for cooking family meals has suffered as a result. Well, long story short, I think Arthur's eaten more vegetables this week than he has in the whole of the rest of December. Basically this book is the inspiration I've been searching for and I encourage you, if you want to up your kitchen game with ease, to get this book and follow Sarah Waldman's blog too. You won't regret it. I've included in this post her recipe for quick chocolate citrus cake. This dense, delicious cake has been a massive hit in our house (particularly with Terry's Chocolate Orange loving me and Arthur!). Just to clarify - this ISN'T my recipe and I want to give full credit where credit is due. Pre-heat the oven to 210° Celsius and grease an 8 inch cake pan. Line the cake pan with greaseproof paper. Slowly melt the chocolate and butter in a saucepan over low heat until smooth. Add the coconut sugar to the chocolate mixture, stir well, and set aside to cool for a couple of minutes. Add the eggs one by one to the chocolate mixture, whisking well after adding each egg. Add the flour and the orange juice and stir to combine. Pour the batter into the prepared cake tin and bake for around 25 minutes or until the center of the cake looks just set. Once removed from the oven allow the cake to cool for ten minutes or so still in the cake pan on a wire cooling rack, then carefully invert the cake onto the rack and peel away the greaseproof paper. 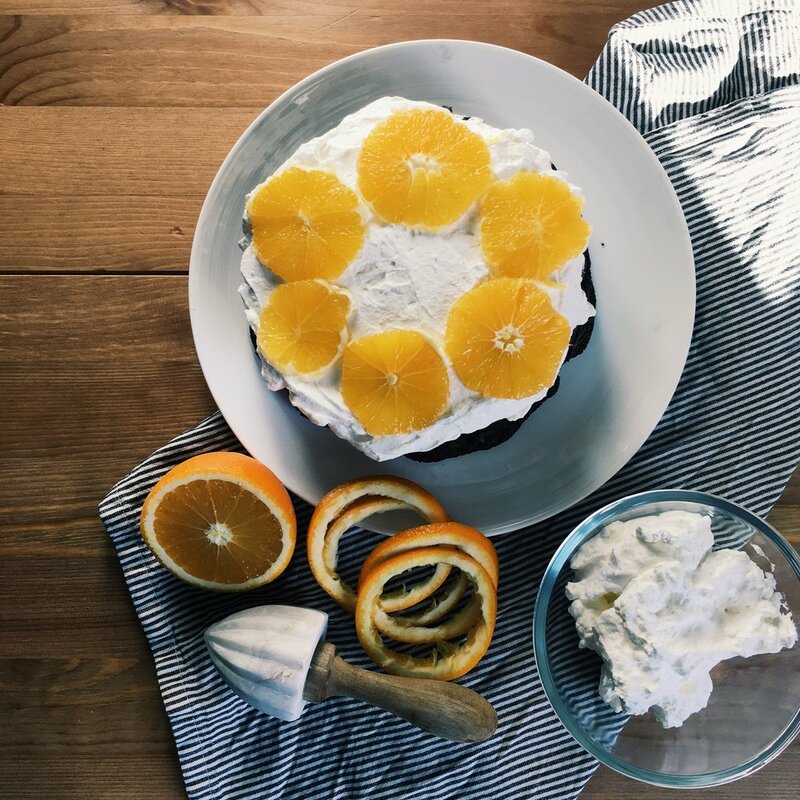 Allow the cake to cool completely before topping with the whipped cream and oranges. 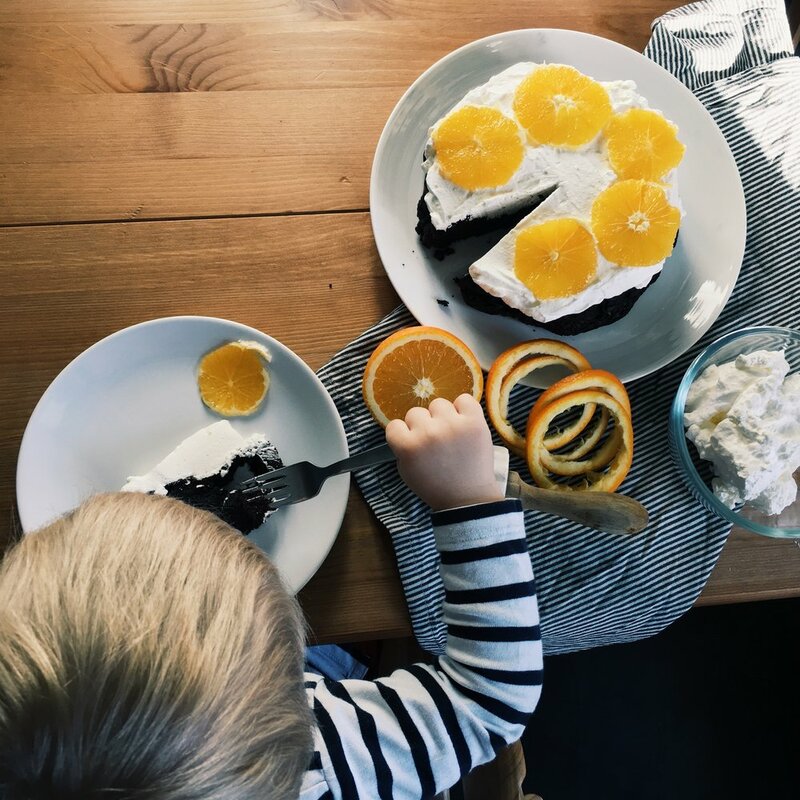 This cake is decadent enough to be served as dessert at your next dinner party, but equally just as easy to whip up for your kid's gouter or evening dessert. It was such a treat to have chocolate cake mid-week that Arthur thoroughly enjoyed it, as did I!